Preheat oven to 350° F. In a large bowl, add cookie mix and egg, butter and water as directed on cookie pouch. Roll out onto floured countertop to 1/4 inch thickness. Using a gingerbread man cookie cutter, cut into shapes and place on greased cookie sheet. 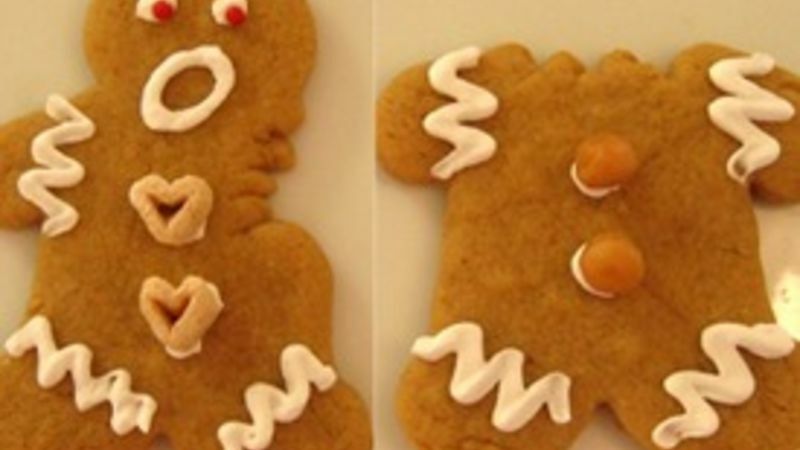 With a sharp knife, cut off an arm, leg, or head of each gingerbread man. Use a zig-zag pattern to look like it was bitten off. Bake at 350° F for 7-11 minutes until barely brown. Cool completely. When cooled, decorate with icing and any desired sprinkles. One of my very favorite things about the holidays is the COOKIES! Everyone loves a great cookie, and gingerbread men top the list of my personal favorites. However, no one in our family likes to be too traditional, so we changed these Silly Gingerbread Men a little bit and the results were quite fun. My kids are always trying to sneak nibbles while we’re baking, and it inspired me to make these funny gingerbread men. I’m sure if you put one or two on top of your holiday goodie plates they’ll be a hit! I know I'd laugh if I got some. The best part is that these little guys are a snap to make with Betty Crocker Gingerbread Cookie mix! I’m a fan of soft gingerbread, and the Betty Crocker mix makes perfect, soft gingerbread cookies. Simply make up your cookie mix, cut into regular gingerbread shapes and place on a baking sheet. Using a pointed knife, cut off a leg, arm, or head using zig-zag cuts (so it looks like it was bitten off). They’ll look very jagged on the pan but the line will soften when baked. When cookies are baked and cooled, let everyone have fun decorating. Don’t forget to give your gingerbread men sad or surprised looks….of course they’re wondering where their arm or leg went! Hope you’re having fun at your own homes making holiday cookies! What are your favorite cookie recipes? Mandy Heaston is a busy mom, gourmet cook — and opera singer! Look for Mandy’s posts on Tablespoon, and check her member profile often to see what she’s cooking up!